Although the parasite responsible for causing malaria has been in existence for at least 50,000 to 100,000 years, its population significantly increased around 10,000 years ago, a time concurrent with the beginnings of agriculture and human settlements. Malaria was once common in most of Europe and North America and was only declared eliminated from the United States in 1951. The World Health Organization estimated that in 2010 there were 219 million cases of malaria and 600,000 deaths, 90 percent of them in Africa. The lifecycle of the malaria parasite, which involves both an insect and a human vector, was determined during the final decades of the nineteenth century. In 1880, the French army doctor Charles-Louis-Alphonse Laveran observed the presence of protozoa (single-celled microbes) within the red blood cells of malaria-infected patients and speculated that it might be responsible for its cause. Working in Calcutta, in 1898, the British physician Ronald Ross determined the complete lifecycle of the malaria parasite in mosquitoes and established that the mosquito was the vector carrying the Plasmodium parasite to humans. Ross and Laveran were awarded the 1902 and 1907 Nobel Prizes, respectively. The female Anopheles mosquito, carrying the Plasmodium, feeds on human blood. In the process, it injects the parasite into the bloodstream, through which it invades liver cells and produces tens of thousands of merozoites per liver cell. The merozoites enter the bloodstream (where they cause malaria-characteristic periodic chills and fever), penetrate red blood cells, and reproduce. When a mosquito bites an infected human, it ingests sporocytes, which travel from the mosquito’s gut to its salivary gland, restarting the cycle when it bites another victim. One type of genetic resistance to malaria has been attributed to changes in red blood cells, deforming the cells into a sickle shape, which interferes with the parasite’s ability to invade and reproduce in these cells. Sickle-cell disease, the most commonly inherited disease among individuals of African descent, reduces the frequency and severity of malaria attacks, particularly in young children who are most affected by malaria. Sickle-cell disease may, therefore, confer an evolutionary advantage for those residing in Africa where malaria is prevalent. SEE ALSO: Agriculture (c. 10,000 BCE), Blood Cells (1658), Inborn Errors of Metabolism (1923). 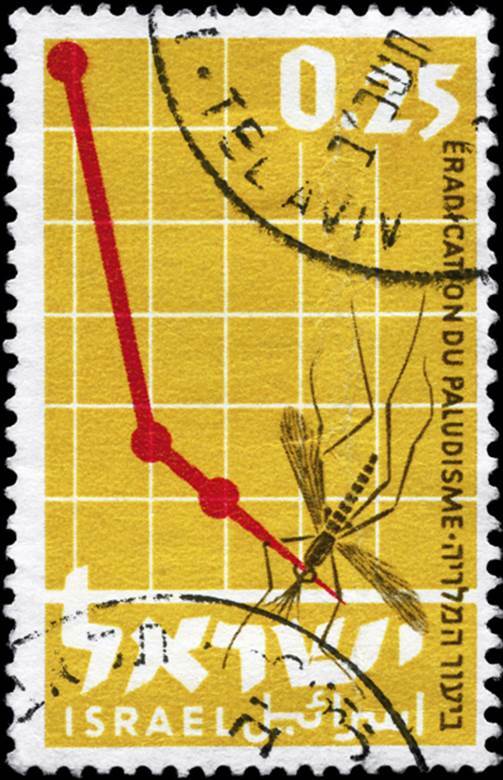 An Israeli postage stamp illustrates both the Anopheles mosquito and the sharp decline in malaria in that country. There are some 484 species of Anopheles, but only 30–40 transmit the Plasmodium, which causes malaria in endemic areas.